Jenna: You wouldn't be trying to get rid of me, would you? Avon: I have to get rid of Blake first. You're next on my list. 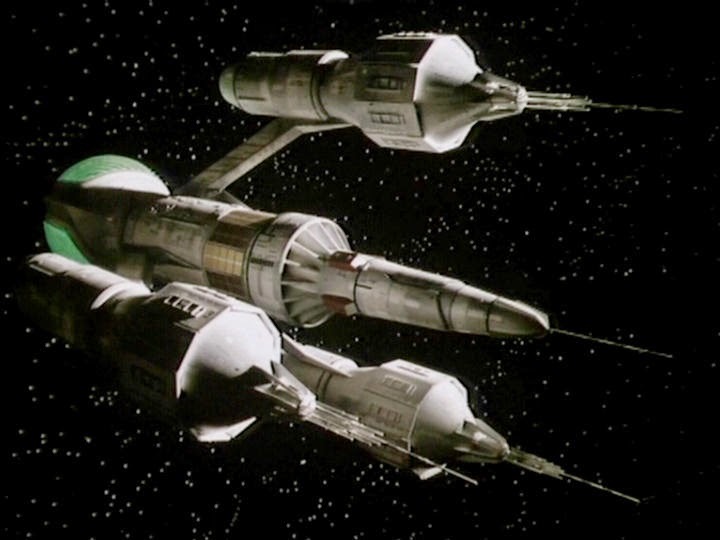 Blake, Jenna and Avon follow the prison ship London to Cygnus Alpha in their newly acquired ship. They explore the ship, discovering hand weapons and a teleport facility. They also encounter the ship's main computer, called Zen. Zen informs them that the ship has been named 'Liberator' but is reluctant to give them any further details about how it operates. Meanwhile the London has deposited it cargo of prisoners, including Vila and Gan, on Cygnus Alpha. The prisoners encounter a group of what appears to be priests who take them to a medieval looking castle. Blake risks the teleport device and goes down to the planet's surface. He meets with the priest's fanatical leader, Vargas who explains that his ancestors, the first prisoners left on the planet, created a religious order so that they could survive. Each new batch of prisoners become new recruits to the order so he is unwilling to allow Blake to take any of the prisoners away. When Blake refuses to give up the Liberator, Vargas has him tortured and locked up with the other prisoners. 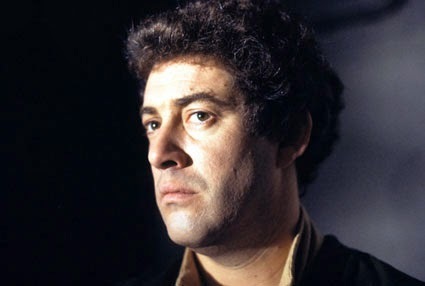 Blake stages a breakout but all the prisoners, other than himself, Vila and Gan are killed. The three of them teleport back up to the Liberator but discover that Vargas has also teleported up with them. Vargas tries to take control of the ship but Blake teleports him into deep space where he explodes. Blake: Worked on a government project that looked into the possibility of matter transmission. It's not clear when he worked on this project: was it before or after his first attempt to rebel against the Federation? The project failed as they were never able to successfully transmit living matter. Blake is the first to try out the Liberator's teleport device that seems to operate along similar principles to the failed project. Fortunately for him the teleport works. Avon: Has personality clashes with both Blake and the ship's computer, Zen. Isn't able to accept the fact that the computer might have a will of its own although he does acknowledge that the Liberator has an almost organic feel to it, making it seem alive. He's the first to find the Liberator's 'strong room' that holds uncounted riches. He tries, unsuccessfully, to persuade Jenna to abandon Blake and leave in the Liberator with him and the treasure. He also initially attempts to stop Jenna from teleporting Blake and the others back up from the planet at the end of the episode. Avon also worked on the same matter transmission project as Blake although neither of them were aware of the other (Avon: "Small world. ", Blake: "Large project."). Jenna: Establishes some sort of mental link with Zen when she touches a control panel and brings him on-line for the first time. The name of the ship, 'Liberator', comes from something that Jenna was thinking when she was in mental contact with Zen. 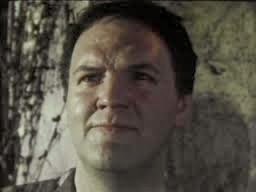 Vila: Is nervous about venturing out on to the surface of Cygnus Alpha and his attempts to lighten the mood with humour irritates some of his fellow inmates. As in the previous episode, he sticks closely with the bigger and stronger Gan. When offered the chance to escape he, not surprisingly sides with Blake and Gan. In the final fight with the cult members, Vila initially hides under a table, before getting hold of a teleport bracelet. Later he appears horrified when he (accidentally?) stabs a cult member in the back. Gan: Seems to be quite protective of Vila, warning the other prisoners to back off. Takes charge when the prisoners venture out on to the surface of Cygnus Alpha and catches the eye of female cult member, Kara, who later sacrifices herself to save him. Gan is the first join with Blake when he offers the prisoners a chance to escape Cygnus. 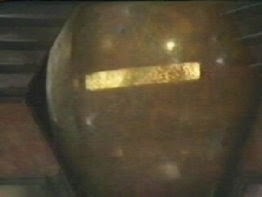 Zen (Peter Tuddenham)/The Liberator: Zen is the main computer of the alien ship that Blake and his friends have 'acquired'. 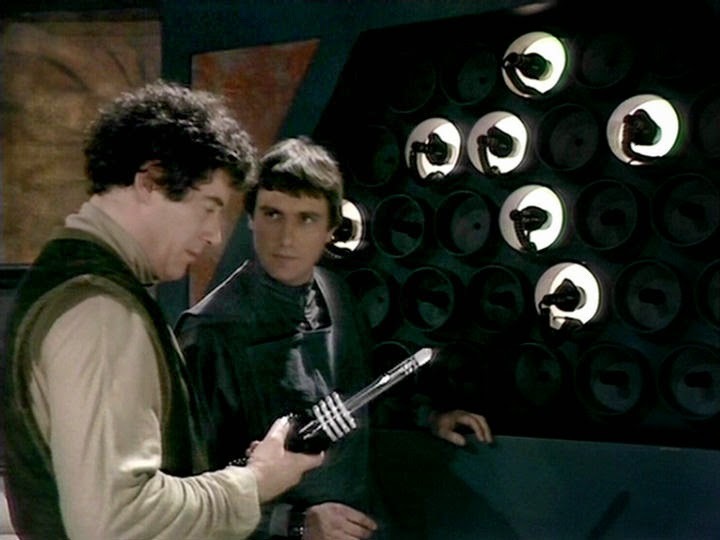 He first establishes some sort of mental link with Jenna, presumably to establish whether Jenna, Blake and Avon are hostile, and then informing them that the ship's computers will accept their commands. He also renames the ship 'Liberator', taken from something that Jenna was thinking. His main 'visual reference point' for crew members is a smooth, circular surface set into one wall of the flight deck. Small lights flash across the surface when Zen is functioning and a larger rectangular light comes on when Zen speaks, flashing in time with his voice. Zen seems reluctant to give Blake and his friends too much information about the ship, stating that "wisdom cannot be given, it must be earned." He also doesn't seem to like Avon. The Liberator's flight deck contains an armoury holding some unusual looking 'guns'. Only one gun is allowed to taken by any one person, although this rule is ignored in future episodes. The ship also has a teleport facility. A process that the Federation has yet to perfect, the teleport works in much the same way as the transporter from 'Star Trek': those being teleported stand inside a small alcove while someone else works the controls on a nearby console. The main difference is that the individual being teleported must be wearing a teleport bracelet, a flimsy looking device that also contains a communicator. 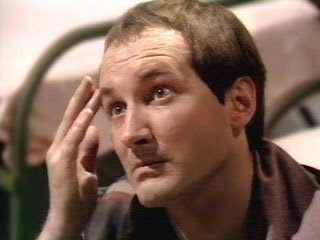 I read an article in a recent issue of Doctor Who Magazine which said that Terry Nation's main source of inspiration was...Terry Nation. And that's certainly the case here as Nation takes an idea that he'd originally come up with in 1965's 'Daleks Masterplan' (the idea of a prison planet where the prisoners are left to fend for themselves) and expands on it. Whereas in the Dalek story, the criminals were brutal savages who were barely surviving, here we see what happens when the prisoners are able to form a society. 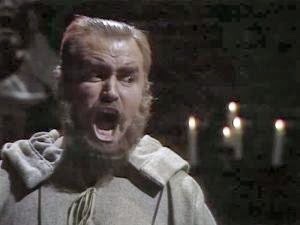 It's a pretty unappealing society, based on fear and presided over by the shouting beard that is Brian Blessed but, from what little we see of Cygnus Alpha, it's infinitely preferable to dying alone on the surface of the planet. The main story though concerns Blake trying to recruit a crew for his newly stolen ship. In order to inject a bit of suspense into proceedings, two hitherto unseen prisoners are introduced as potential Liberator crewmembers. To the surprise of probably no one both characters are killed in the climactic battle between prisoners and cult members leaving the already established Vila amd and Gan as the last men standing. Brian Blessed's character, Vargas ends up being teleported into deep space and explodes mid-rant. In space no one can hear you scream - unless you're Brian Blessed. The other new arrival to the crew is of course Zen, the ship's computer. Peter Tuddenham's vocals give Zen the air of an no nonsense school teacher, happy to impart knowledge where appropriate but not prepared to tolerate any nonsense from the kids. His verbal slapping down of Avon in their first encounter is a particular highlight. Sadly, Zen's character doesn't really much more beyond what's seen here but, despite that, he's still one of my favourite characters in the series. Jenna doesn't get a whole lot to do in this episode other than change her outfit and have some interesting scenes with Avon, who has quickly established himself as the most interesting member of the crew. His attempts to persuade Jenna to leave without Blake show just how self-centred and untrustworthy he can be. 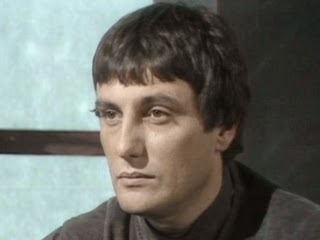 Blake's 7 would have been a far duller series without Avon that's for sure and Paul Darrow is clearly enjoying himself in the role. Overall then, a solid episode, if unspectacular and livened up no end by Brian Blessed.